In recognition of his contributions in basic science related to cancer research, Sloan Kettering Institute Director Thomas J. Kelly has been awarded the 2004 Alfred P. Sloan, Jr. Prize by the General Motors Cancer Research Foundation. On June 9, Dr. Kelly will deliver a Laureate Lecture at the Foundation’s Annual Scientific Conference at the National Institutes of Health. An awards ceremony will be held at the Department of State that evening. 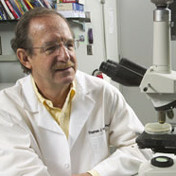 Dr. Kelly’s research has focused for many years on the ways in which replication of DNA is initiated and controlled. In 2002, Dr. Kelly and his colleagues pioneered the development of cell-free systems that made it possible to study the biochemistry of DNA replication in human cells. More recently, he has focused on the control of DNA replication during the cell cycle, a problem with particular relevance to cancer. A member of the National Academy of Sciences and the Institute of Medicine, Dr. Kelly came to Memorial Sloan Kettering Cancer Center in 2002 from The Johns Hopkins University, where he directed the Department of Molecular Biology and Genetics. He also led the interdisciplinary Institute for Basic Biomedical Sciences. In addition to serving as SKI Director, Dr. Kelly heads the Laboratory of Regulation of Eukaryotic DNA Replication and holds the Benno C. Schmidt Chair of Cancer Research.